After Caleb has been rescued, as the crew prepares to climb the mountain. They tried. Several times. They led him out of the compound and told him to go. Every time the horse would simply nod his head and turn back. 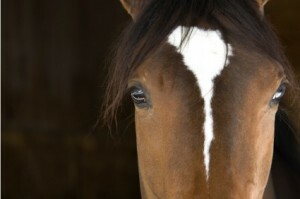 The horse raised his head and looked Zinovy in the eye. Then he turned and walked away. At the edge of the compound he stopped and whipped his head around again. Zinovy waved him on. The Arabian nodded once more, gave a loud whinny, then ran off at a gallop. “Some day we’ll meet again,” Zinovy whispered. It was a prophecy, meant for the future. But for now, there was a mountain to climb.